The mother of a murdered girl has said she is horrified the killer was paid for his artwork to go on display. 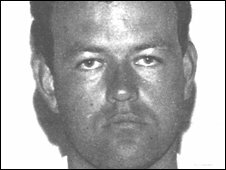 Colin Pitchfork was jailed for life in 1988 for the murder of Lynda Mann and Dawn Ashworth in Leicestershire. The sculpture was displayed at London's Royal Festival Hall but has now been removed. The firm responsible for installing it has apologised. The work was bought for £600. Lynda Mann's mother Kath Eastwood said she was "disgusted" by the news. The Southbank Centre bought the work, called Bringing Music to Life, after it was featured in an exhibition of prisoners' art. The exhibition had been organised by the Koestler Trust, which encourages prisoners to take up art and then helps them exhibit and sell the work. Ms Eastwood said: "How can his mind work and what does he think he's going to achieve? "He's been rewarded now - the families of both victims are left to carry on suffering and going without their family. "Art is art maybe but he's hiding behind that - it's not going to change him and I can't feel anything but anger." A spokesperson from the Southbank Centre said: "'We very much regret any offence that we've caused and have taken the artwork off display. "We are presently in conversation with the Koestler Trust about future policy." Tim Robertson, chief executive of the Koestler Trust, said he understood the centre's decision to remove the work. "We are extremely sorry if the display of a Koestler Award-winning artwork at the Royal Festival Hall has caused any offence to the victims of a particular offender. "We hope that the naming of a particular individual will neither cause distress to his victims nor jeopardise our valuable work," he said. Lynda Mann, 15, of Narborough, was murdered in 1983. Three years later Pitchfork murdered Dawn Ashworth, from Enderby, who was also 15. Both girls were raped and strangled. Pitchfork, who had worked as a baker, was the first person to be convicted of murder on DNA evidence. He was caught after 5,000 men across three villages were asked to give blood or saliva samples as part of the first ever mass screening for DNA. Pitchfork is due to appeal against his life sentence later this month. He is currently serving a minimum term of 30 years. He wants his sentence reduced to 20 years - meaning he would be eligible to apply for release on parole.